Dive into comfy surroundings at Fairfield Inn & Suites Orlando at SeaWorld . Take advantage of the many exclusive perks you'll receive when staying at our official SeaWorld Orlando hotel on International Drive including discounts on food and gifts at the theme park as well as complimentary shuttle service. Our hotel near Discovery Cove is also close to the I-trolley, making traveling around Orlando's International Drive easy. After a day of excitement and thrills, relax on cotton-rich linens as you enjoy your favorite movies on an LCD TV. Share photos of your family thanks to complimentary property-wide wireless internet as you relax in our spacious guest rooms, perfect for families looking to make vacation memories. Wake up the next morning to a complimentary continental breakfast, and try your luck at one of three area golf courses, or enjoy an under-sea adventure at Discovery Cove . 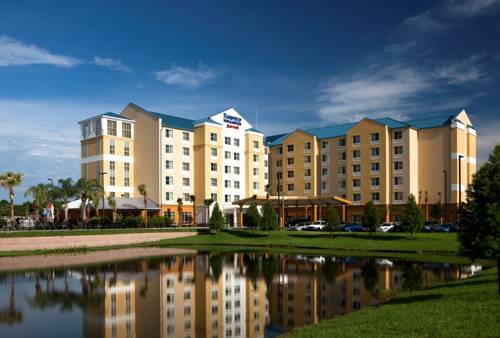 Relaxation and excitement await you at our Orlando hotel. Reserve a room and start your planning your Orlando trip. Savor the fresh sandwiches, burgers, Pizza Hut pizza and cool beverages offered at The Splash Bar & Grill, all while enjoying a refreshing pool-side experience while the kids play in the sun.